Dear Stranger, a letter-exchange project that connects Oregonians from different parts of the state through the mail, strives to create a little understanding across the vastness of this place. For this year’s edition of Dear Stranger, we’re asking people from all over the state to consider some of the questions at the heart of Bridging Oregon, our ongoing cross-community conversation series. Write a letter. Address it “Dear Stranger.” Write about the place where you live or a community where you feel at home. What makes it unique or unusual? Is there anything about your place or your community that you feel is misunderstood by people outside of it? What might help people understand it better? Fill a page or two, or more if you feel inspired. If you’d like, feel free to include a photo or a drawing or a recipe—anything that will fit in an envelope. Print and sign the Dear Stranger release form. We cannot exchange letters without a signed release. When you write to Dear Stranger, your letter will be swapped with that of another writer from elsewhere in the state. They will get your letter; you will get theirs. The exchange is anonymous, and you can share as little or as much information about yourself as you like. Please keep in mind that photos, even ones without people in them, may contain information that could be used to identify you. Dear Stranger is open to everyone, though writers under the age of 18 must have parental consent to participate. (Click here to download the consent form.) Letters are paired at random, though we do our best to match participants with someone outside of their ZIP code. Oregon Humanities staff read all letters before they are exchanged. Letters will be mailed to participants on a rolling basis beginning in August 2018. Letters will be mailed at the end of each month. We will continue exchanging letters received through October 26, 2018. Instructions for replying to your stranger will be included in your letter. If you have questions about Dear Stranger, contact Ben Waterhouse at b.waterhouse@oregonhumanities.org or (503) 241-0543, ext. 122. Hello, Writers! I’m happy repost this from Emily Grosvenor’s blog. Emily was our presenter last September and will return September 2018! 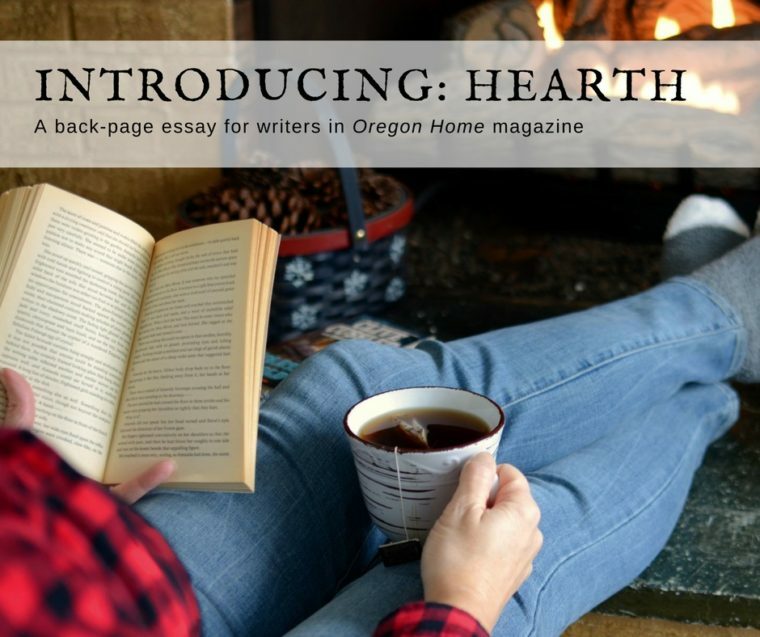 Introducing “Hearth,” a back-page, first-person essay for Oregon writers. Bring your deep relationship to home, a love for everything about nesting, and a funny, thoughtful voice to this new Oregon Home magazine essay section. In a way, nearly every story is a search for home. A protagonist is forced out of a humdrum, lost existence onto a journey where she must grow and change, seek out great mentors, encounter obstacles, and arrive at that point of contentment, or at the very least, transcendence that comes after the greatest battle of all. But for many of us, this search for home takes on a physical shape. It resides in how we occupy spaces in the world, in the story we tell ourselves about our lives through our physical homes, whether they be in a city apartment, country farmhouse, filigreed Victorian, or classic Craftsman. For two decades, Oregon Home magazine has sought to tell stories about how Oregonians build their lives at home. This is no frivolous undertaking. The history of Oregon has always been about how humans connect to the landscape, envision a life here and then build it. The search for home is an idea deeply engrained in life here, and that search is something we recognize for what it is: For many of us, creating a home life is nothing less than the greatest work of art we will ever produce. Think about it this way. Turn off the TV and you’ll remember what the hearth is: The place where we gather to tell the stories that create the meaning in our lives. I will be answering questions you may have here about this new part of the magazine in the comments. Our first “Hearth” essay, a piece on an obsession with antique lighting by novelist Heather Sharfeddin, will appear in our spring 2018 issue, appearing in early March. I will post more of what I pick here to give you all a better idea of the space as it emerges. Thank you for reading, and writing! Topics: Prescient but timeless. As in, these essays have a contemporary feel and might mention ideas or trends that are interesting to homeowners now, but they retain a timeless connection to that yearning for home. They feature physical homes as opposed to cities, landscapes or regions. Writers: Who live in Oregon. – Stories that feel too general, something everybody everywhere has experienced. – Essay pitches. These just don’t work. With essays, you have to read the full thing before you have any idea whether it fits. – Writing by writers that don’t live in Oregon (sorry!). The best way to reach me is by writing editor@oregonhomemagazine.com. I respond to every email. If you do not hear back within a week, please ping me again to remind me. Thank you for sending your work my way!